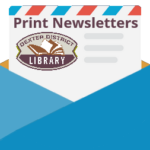 PaleoJoe returns to Dexter District Library for an exciting presentation. Dressing the part of a “Digger” he introduces animals, plants and creatures that have been extinct for millions of years. His high-energy program brings life to these creatures of long ago. Joseph Kchodl, creator of the popular Dinosaur Detective Club series of chapter books really does dig up dinosaurs. He thrills the audience with tales of the prehistoric and brings dinosaurs to life with a T Rex tooth, a Velociraptor skull, dinosaur puppets and a variety of amazing fossils. Dinosaur Day is a 45 minute program geared for ages 4 and up.